CUSTOMERS ON THEIR OWN WEBSITE POST NOTHING BUT COMPLAINTS... TOO FUNNY!!! THIS IS THE BIGGEST HOME INTERNET SERVICE PROVIDER RIP OFF IN THE PLANET. P.S. STILL LOOKING FOR BETTER IPS OUT HERE IN THE AREA. We have talked about this before and agreed. As soon as something better comes by we will be the first to hook up. But until then my only choice is exede because hughesnet is the only other option. And we all know how that is. We would talk about it again Cristian but no one can get a word in edgewise around here with out superhero jumping in, Glad to see you again. The only advantage I had with hughesnet was a 60 day trial period before the contract started, But nothing about them worked out right. I argued with Hughesnet for over a month, There best speeds didn't compare to exede's worst. And I don't brag up exede but it averages out far better. Exactly Bobbie we are here because we don't have conventional internet service available to us. I too would be gone if I could get cable but till something changes I will be here. Rene, if you are having issues with you account/ speed send an email to exedelistens@viasat.com with your account and contact info and they will get you fixed up. I tried sending an email and Exede did respond very quickly to my complaint that my internet speeds are less than 25% of normal in the mornings and evenings. They blamed my Apple router and the fact that I have so many devices attached to it. Additionally, Exede can see not only the MAC addresses but the device names of what's attached to the router. I asked to talk to a supervisor about that and was told that he, the phone technician, is at the top of the escalation tree and there is no one else I can talk to. I'll see about that! It's the best of the two choices I have so we will half to hang with it until something better comes along. There are a lot of satisfied customers, like me. We just don't post this that often, because it isn't interesting news. If you like where you live, and where you live limits the kind of internet you have available to you, then it makes the most sense to lower your expectations to what you can get, and look for the best options among your real choices. I have exactly 2 options: exede or hughes net, and I carefully researched the differences between the 2 cos plans before signing up. when I first signed up I chose Hughes because at that time they offered the better deal for me. A few years later when I wanted to upgrade to higher speeds, Exede had the better offer to suit my needs, so I cancelled hughes and got Exede. I can only afford the least expensive plan available to me, which allows 10gb per month, and yet I never go over and actually have gb left at the end of the mo. I have found a way that I can stream and record netflix and amazon prime video during free time and then watch what I record at the time of my choice. I don't limit how much I am online, but pay close attention to my use of anything that uses up my data allowance, like videos that auto start and auto downloads except during late night free zone. My speeds do vary a lot depending on time of day and "congestion" in my area, but are never so slow I can't do email and surf what I want to. I can hear how frustrated you are, and I do understand to a certain extent because I'd like to have unlimited data usage if I could and those "lightening fast speeds" commercials always talk about. But do you have any specific problems you would like feedback about on this forum? Perhaps there are some things you could do to make your experience not quite so bad. I had that same experience and if you remember when they had the free give away and the ops were giving everyone that complained free data that there were a lot more complaints. People were crying wolf just to scarf up on free data. Now I don't know if they give it. I don't know either. The only time I got free data was when they were having 5 gig give away. Did get free 5 gigs around Christmas time so could down load some YTD things. But a lot of people were getting it a lot . I'm happy with my 10Gig plan. If could get Liberty 12 gig would get that but not available to me at this time. But sticking with Exede. Have had good luck with them. A lot of problems that show up here are just out of boredom I learned a bit of time will fix most things. Its nice Helen being able to have little conversation with old faces :) nice seeing you again. Nice seeing you again too Bobbie. Have a nice Memorial Day weekend. We had the same thing Lorrie but hughesnet had a 60 day trial period which was plenty of time to convince me to change. My only real gripe with exede is I think especially if you buy a extra gig it should be rolled over if not used. Other than that we might as well be happy. I think I have been fortunate with both Hughes and Exede in that at the times I had each, they delivered what they said they would in my contract signed at the time I got each, and so I didn't have any need to cancel anything. In fact in the 3 yrs I had Hughes I think I only had to contact them once or twice with a problem, which was nothing major, and with Exede, I haven't had any problems. (I switched to exede rather than upgrading to higher hughes speeds because I could get more for my money with Exede based on plans offered and what I could afford). I do wish the unused GB would roll over, but as it stands now, I don't have any choice since there is no other plan available to me that does offer that. I think one thing that makes it easier for me to accept the limitations that go with satellite internet is that I have lived in the country for over 20 yrs, so I never did have access to any superior kinds of cable or high speed internet...when I first got hughes and then exede, all I was was delighted at the improvement over dial up! I would imagine that for people who have had land based broadband, that moving to less populated areas and having to switch to satellite internet must be hard. But rather than getting angry at the satellite internet providers, I am more irritated at the failure of the big broadband/cable cos to provide service where I live. but even then, I know that it is my choice to live in a more rural area and there are reasons the big cos don't provide broadband here--their goal is profits, not to make me happy. Seems like a long time now I have been hearing that the government wants everyone to have access to high speeds no matter where they live...but these intentions haven't turned into anything better here where I live, at least not yet. I do regard satellite internet in a fairly positive light, because if they hadn't come along, I wouldn't have ANY high speed choices and would still be using dial up. ugh. The op is a pefect example of some one not being informed of the limitations of satellite internet...... spoiled on cable. im sorry the comission earning sales person did not fully explain the limitations of the system. Hi Everyone--Well I do have a choice. They just put Casair Tower just down the road from me. Unlimited data-- -BUT for what I'm paying for my 10 gig plus leaseing equipment-$69,99 can get the unlimited Casair but the speed is only 5Mmb I'm spoiled by 12 mb downloads. 2> there are a lot of Casair towers going up in the rural areas. So I'm thinking how long is going to be before there's going to be congestion. So I'm sticking with EXEDE. So far beam I'm on is not congested. I am very happy with my service here are my results. Hi Rene, I understand viewing your emails are a huge necessity. 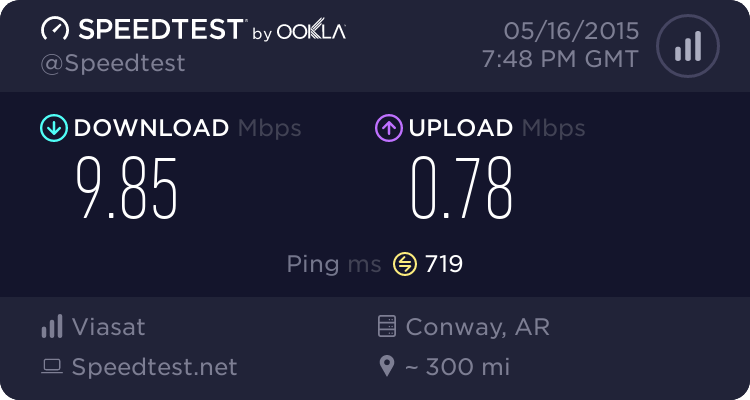 I ‘m sorry your speeds have been so slow I would be more than happy to review your account to see if we can improve your speeds. Please send an email to exedelistens@viasat.com. Thank you.